How to Get Rid of Gophers in your Yard - Gophers live in long tunnels with multiple entrance and exit points. Their mounds are horseshoe shaped with loose dirt around the hole and they can create up to 70 mounds per month. Gophers cause various kinds of damage. In your yard, they will eat the tender roots of grass and other plants in the spring. This is their favorite food. They can also cause damage to your cable, electric, and water lines by chewing through them. Options to get rid of them include getting a dog or letting your dog chase and kill them, and setting traps to kill them. Dogs like to chase small moving animals. If the gopher sticks its head out of the mound and your dog sees it, he can catch and kill it. Kill traps are also available. You need to have patience with this method and they are more effective in small yards. The key to making the traps effective is finding both the entrance and exit holes and placing them there. How to Get Rid of Gophers in your Garden - Gophers are notorious for getting into gardens. They eat the roots of your plants as well as the bulbs of flowers, causing irreparable damage. Gophers are strictly herbivores so a garden is like finding a pot of gold for them. They feed in three different ways; pulling vegetation from above into their tunnel, feed on roots they find as they are digging, and venturing out a body length or so to eat lush vegetation above ground. To discourage them from feeding on your garden, you can use sonic devices to repel them. Gophers do not like the sound. Another way to get rid of them is to plant castor-oil plants and gopher purge plants. Be careful when planting these. They should be clearly marked and have a brightly colored cage or mesh fence around them to prevent accidental harvesting. Not only are they poisonous to gophers, but children as well. How to Get Rid of Gophers in the Farm Fields - Gophers find farm fields especially enticing. There is an unlimited supply of roots for them to feed on. During the early growing season, they will eat as many seedlings as they can find. They also have the added benefit of shelter because the plants are so dense and so high. Eating above ground plants becomes easier as well due to the greater amount of shelter. Gophers are also adept at rerouting irrigation channels to make their burrows and tunnels safe. You can get rid of them in several different ways. Modification of their habitat can make the gophers move out of your farm fields. Even though they can reroute irrigation systems, using flood irrigation is something they cannot control. Water will flood the gophers’ tunnels and that will either kill them or force them to the surface, making them vulnerable to predators. To make it more effective, lower the number of high spots in your field so they cannot find a safe spot. How to Get Rid of Gophers in your Golf Course - Have you seen the movie “Caddyshack”? If you have, then you know what a comical approach the groundskeeper had to get rid of their nuisance of a groundhog. If you haven’t, rent the movie. Groundhogs in golf courses can damage the greens so much that it’s almost impossible to play. The cost of repairing them is very expensive, causing damage to the golf course’s bottom line. They will eat the roots of grass and make the lawn turn brown in spots. They also create multiple mounds, making the green uneven and unattractive. Owners of golf course often choose more aggressive routes, like using toxic methods, to eliminate the gophers. There are a couple of different chemical concoctions you can use. The first is strychnine on grain baits. It is highly lethal, often causing death within an hour. Another way is the use of Zinc phosphide. This is an anticoagulant and poison. Baits do decompose in burrows that are moist, so you will need to check back often and replace them. How to get Rid of Gophers in the Lawn - Gophers in a lawn can cause significant structural issues for any buildings on the property. Gophers are not as content as woodchucks to live in a burrow system of just a few tunnels. Gopher networks can be very extensive and can span over acres of property. 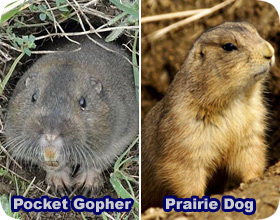 If you have a gopher problem in your lawn, these little animals need to be trapped and removed as soon as possible. Lethal trapping is the most common method of control for gophers. These rodents spent most of their lives below ground, making cage trapping difficult. Body gripping traps can be installed inside of a gopher tunnel. Because of the potential for large number of gophers to exist on a single property, professional help is advised before trapping is initiated. Gopher families are often a part of a much larger city network of tunnels. If you remove just one branch of the system, more gophers will move in. Professional assistance is important when determining where to set traps and what areas should be addressed first. When all of the gophers have been removed the tunnel systems can be filled in. Monitor the holes for a few weeks after nuisance resolution to make sure they have not been re-dug. Go back to the main Gopher Removal page for more information about how to get rid of fox yourself.